A threatened city farm, which houses several rare breeds of animal, has been saved from closure in Liverpool. Liverpool City Council, which said it could not afford to run the farm, has made a deal to save the farm at Croxteth Hall and Country Park. Labour mayor Joe Anderson has agreed a new partnership with Alt Valley Community Trust to take over the farm. The trust will work with Lancashire-based Myerscough College and nearby Larkins Farm. 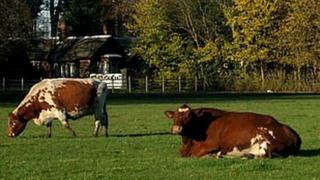 Mr Anderson said the council could not afford the £200,000 annual running costs for the farm. "We have been talking for several months to Larkins Farm and Alt Valley Community Trust about entering into this partnership, not only to keep the farm open but also invest and develop it for the future," he said. Phil Knibb, executive director at the trust, said: "We are confident we will be able to make the farm sustainable in the long term and are excited at its potential as an education, agriculture and training centre." Among the rare breeds at the farm are Irish Moiled cattle, Boreray sheep and a Bagot goat.